Logitech is one of the top brands that has pleased PC gamers across the globe with some of the best gaming mice, using optical technology and laser sensors. Every Logitech mouse that is labelled as a gaming mouse has something unusual/unique for gamers. The Logitech G502 FPS gaming mouse is unique per design and comfort. It has a moderate size with enough room for the gamers who want a mouse with good palm grip and claw grip. All 11 buttons are cleverly arranged on this mouse so that a gamer can easily use them. These buttons include a left click button, a right click button, a scroll wheel with clickable functions in three directions, two DPI buttons, three buttons are on thumb size, and two are below the scroll. The button just below the scroll wheel can be used to fine-tune mouse’s friction, and this button is not programmable. The scroll wheel is super-fast with free scrolling and click-to-click responsiveness features. It is solid enough to make you feel that an action is actually performed when you click it in any of the supported directions. The buttons are customizable with the use of Logitech’s gaming software, which is really an intelligent tool. It automatically detects the games installed on your computer and then creates profiles for them. However, to let this software create gaming profiles, you have to scan your PC using it. Once the profiles are created, you can review them and if want to make any change, just do it. So, it saves plenty of time that could have been wasted in creating gaming profiles for different games from scratch. 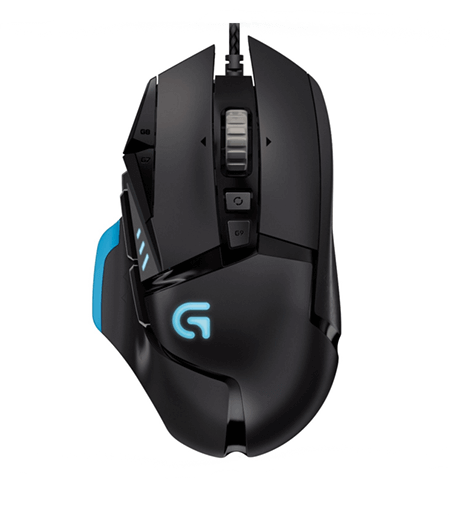 Also, the Logitech G502 FPS gaming mouse has the capability to save 3 profiles within its own memory, which means if you want to play any of your favourite games at your friend’s place or if you have participated in an event, you can carry this mouse with pre-built profiles. It has the Pixart PMW 3366, and I have to say that it tracks all types of surfaces without any problem. It also gives you the flexibility to adjust illumination and DPI range. You can adjust the DPI range from 200 to 12,000 to get the desired sensitivity. 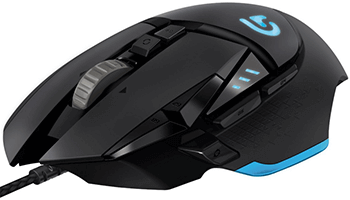 12,000 DPI is too high to make your mouse extra sensitive, which might not be of your use, but if you can use it then Logitech G502 FPS gaming mouse is great. 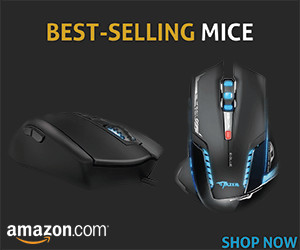 There probably isn’t any other mouse in this price range that offers a DPI range up to 12,000. Its original weight is 8.8 ounces, but if you want to adjust this weight, there is a magnetic opening at its bottom. Open that and adjust the weight as per your needs. Overall, it is a great mouse with outstanding features and usability.